In 2010, the entire world’s attention was on the plight of a group of thirty three Chilean miners who were trapped in an 100 year old mine as an international team worked tirelessly to get them out. Now, these intense and trying sixty nine days are coming to the big screen with the Patricia Riggen (Girl in Progress) directed The 33. The generic pop song aside (anyone else see the irony of using a song with the lyrics ‘I’m giving up on you’ as the soundtrack to one of the greatest rescues of recent years?) 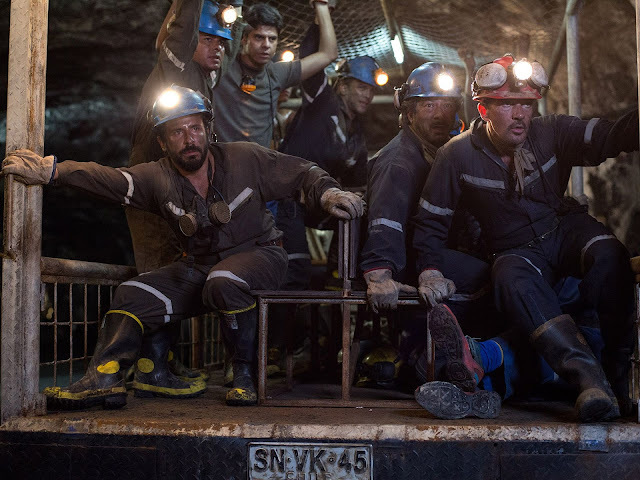 , our first look at The 33 shows a lot of promise, with a solid cast, including Antonio Banderas, Bob Gunton, Juliette Binoche, Gabriel Byrne, and James Brolin, and a story that not only focuses on the personal lives of those trapped in the mine and the people they’ve left alone up above, but delves into the politics behind the rescue attempt as well.